The DMX test board was designed to do loop back testing at the MDSX instead of using a streaker card on a live MUXpossibly causing a service event. 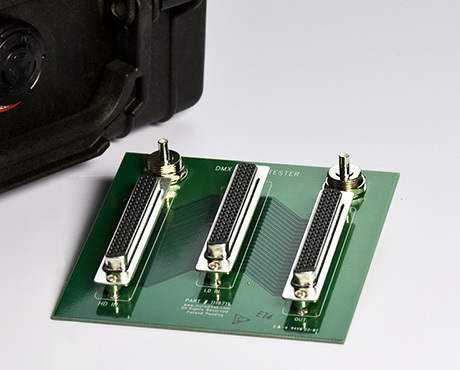 The connectors on this board were designed to directly mimic the connector layout on the rear of the DMX and DMXtend. This was done so the installer can fully dress the cabling into the bay and test the cables as if they were plugged into the system. © 2014 BY INCREDITEK. ALL RIGHTS RESERVED.